More than 80 bird species including parrots, wrens, honey-eaters, finches, whistlers, pigeons, raptors and numerous water birds, reside in the Blackwood River Valley for all or part of each year. Over 70 bird species have been identified at Tweed Valley Lodge. Each suite has a West Australian bird identification book to enable guests to answer that common question "What bird is that?" 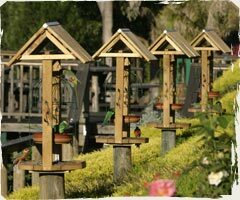 This amazing variety of bird life has become a major attraction at Tweed Valley Lodge with a corridor of purpose built bird feeders providing spectacular viewing of the antics and sounds of the parrots and other birds that arrive daily. Regular guests make a point of arriving at the lodge just before afternoon feeding, which takes place around 4pm in the winter months and 6pm in the summer months. 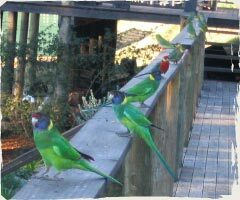 A multitude of parrots arrive each afternoon to engage in a feeding frenzy that is a delight to see, particularly the pecking order that prevails among the Australian Ring-necks, Red Cap Parrots and Western Rosellas. Early morning viewing is also a 'must do' as these beautiful creatures call in on their way to the office to finish off what they left behind the day before. 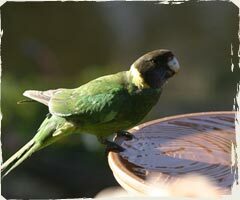 Birdbaths are adjacent to each feeder in full view of our guests from their verandah. Throughout the day numerous smaller birds forage in and around the bird feeders. Our most common residents include families of Splendid Fairy wrens, Red-eared Firetail finches, New Holland honeyeaters and Silvereyes that have made Tweed Valley Lodge their home. Bird antics caught on camera! Press play below to see a sample of the daily show put on for Tweed Valley guests.